This is plate 48 from William Hodges' book 'Select Views in India'. 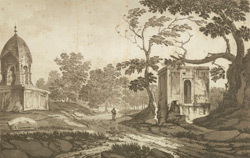 Hodges went to Murshidabad in 1781, and it is likely that during this visit he came upon this cluster of monuments on the city's outskirts. They had been erected in memory of women who had performed the act of Sati, which Hodges described as "a well-known custom amongst the Hindoos, that the women, upon the death of their husbands, burn themselves on the funeral pile of the deceased". It is questionable whether the act of Sati was as "well-known" as Hodges believed. He claimed to have witnessed a Sati in October 1781 while in Varanasi, and although he was clearly fascinated by what he saw, he also expressed horror and outrage at the practice.